The move is another apparent return by the government to the practice President Trump has called "catch and release" and promised to end when he was a presidential candidate. Some migrant advocates say the release appears timed to bolster the administration's claims of a crisis at the border. But officials at Customs and Border Protection say their main concern is safety in the government's overcrowded detention centers. Migrants who are released will be given orders to appear later at court hearings to determine their eligibility for asylum. Those who are not eligible face deportation. "To mitigate risks to both officer safety and vulnerable populations under these circumstances, and due to limited bed space, CBP will begin releasing families in the RGV Sector with a Notice to Appear (NTA) / Own Recognizance (OR). RGV Sector will continue to coordinate with state and local stakeholders and non-governmental organizations while these temporary measures are in place," said an official at CBP, the parent agency of the U.S. Border Patrol in an emailed statement. The timing of the announcement is "suspicious," according to Elizabeth Cabazos, a member of Angry Tias and Abuelas, a volunteer group that aids the migrants in McAllen, Texas. "We've been maybe too bold in stating that there is no security crisis, things are fine here and maybe to save face, they are trying to manufacture a crisis and they're saying, oh yeah, try this," Cabazos told NPR's Joel Rose. This is not the first time migrant advocates have suggested that the Trump administration is "manufacturing" a border crisis by periodically releasing large numbers of migrants as evidence of an overrun border requiring a large investment of personnel, technology and the proposed border wall. Administration officials are sensitive to that charge. Earlier this week Homeland Security Secretary Kirstjen Nielsen called the border situation "a near system-wide meltdown." "I want to cut through the politics to tell you loud and clear: there is no 'manufactured' crisis at our Southern Border," Nielsen said at a cyber- and homeland security conference in Washington, D.C. "There is a real-life humanitarian and security catastrophe." According to CBP data, Texas' Rio Grande Valley is the hotspot for apprehending migrant families crossing the border between ports of entry. So far this fiscal year, which began in October, more than 58,000 migrants in family units have been caught, or about 40 percent of those apprehended at the southern border. The El Paso sector comes in second, with more than 36,000 migrants intercepted. Despite the current spike, southwest border apprehensions are at historic lows. In fiscal 2018, 396,579 people were apprehended, In fiscal 2000, more than 1.6 million people were apprehended. The focus on the Rio Grande Valley comes as Nielsen is scheduled to visit there Thursday. Her visit will mark the third time since October 2018 that her presence at the border was preceded by a release of migrants in a border community. "In October, more than 700 were released in Yuma, Ariz., just days before Nielsen testified before the Senate on Capitol Hill," NPR's Joel Rose reported. When Republican Sen. Jon Kyl of Arizona said that local aid groups were swamped with the task of caring for the released migrants, Nielsen responded that Congress needs to change the law requiring children to be held no longer than 20 days and allow families to be detained together until they are removed. A few days later, Nielsen was at the border in nearby Calexico, Calif., touting the proposed border wall. In late December, days before and including Christmas, ICE officials released up to 800 hundred migrants over four days in downtown El Paso, Texas, without alerting local aid groups who were left scurrying to help the migrants with food, shelter and transportation. A few days later Nielsen was back at the border in the wake of the deaths of two children in U.S. custody, an event that spurred calls for the administration to improve conditions at the detention centers. Some advocates say the pattern of migrant releases and Nielsen's border visits is intentional. "They wanted to create the conditions for a narrative to make it appear as a crisis," Fernando Garcia, founding director of the Border Network for Human Rights in El Paso told NPR. There is no doubt that the sheer volume of migrant families is straining the system, said former ICE acting director under President Barack Obama, John Sandweg. 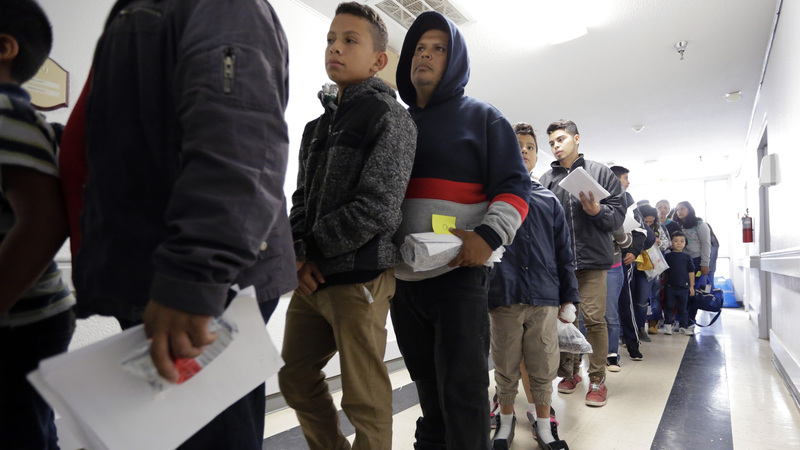 The administration needs to treat the migrant flow as a humanitarian crisis, not just a national security threat, said Sandweg, now the founding partner at Frontier Solutions, an immigration law firm. "Those numbers will overwhelm the system quite quickly. But I think that highlights the fundamental problem as we have not made investments in the system itself," Sandweg told NPR.